The collection is packed and ready to be shipped. The generosity and spirit of the Joel Schiff Collection filled more than 70 large crates and weighed more than 10 tons. This is heavy stuff. Beyond the weight of the collection, Joel also filled in the blanks in kitchenware knowledge. He created a broad array of historical connections through both his collection and his writings. Although we cannot understand all the connections but we can draw some conclusions from the items he collected. The collection could become the framework for further studies concerning American and (to a lesser extent) European cast iron cookware. – Jill Harrison Fine Art and Antiques – Reprinted from the Collection Catalog. 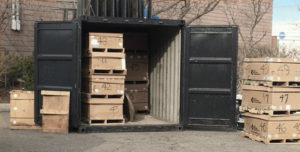 Photo: One of three 20’ storage containers.